Government of Telangana has going to recruit (13357) posts in various categories in the TS TRANSCO, TS GENCO, TS SPDCL and TS NPDCL Power sector through Direct Recruitment .The Telangana Energy Department have submitted proposals for creation of additional posts duly mentioning the requirement in the respective power utilities, in a phased manner. 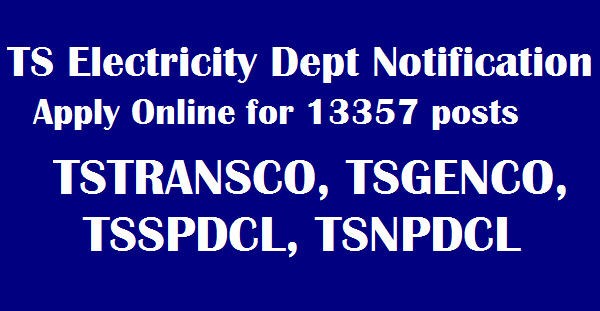 For more details of Recruitment of Telangana 13357 Posts in TS TRANSCO, GENCO, SPDCL, NPDCL Govt Jobs in Power sector Notification ,Syllabus, Online application, Eligibility Creteria, Qualifications TS TRANSCO Recruitment Web portal: http://tstransco.cgg.gov.in/ TS TRANSCO Official Web site: http://transco.telangana.gov.in/index.html . 1. From JMD, TS TRANSCO Letter NO.CGM (HRD)/MPP.1/306/Creation of new posts/2012, dated 30.01.2017. 2. Energy (HR) Department U.O.No.755/HR.A1/2015, dated 05.05.2017. Application Procedure Starts On: Update Soon.. Application Procedure Ends On: Updated Shortly.. Candidates should have completed Engineering, Degree/ Graduation in relevant branches with minimum qualification Marks ins any Government approved University. Required Age : Applicants age should be in between 20 years to 44 years as on closing date of Application. Applicants refer the Individual Department Notifications for knowing Category wise Age relaxation details. 8. Candidates take print out the Application forms for future Usage.